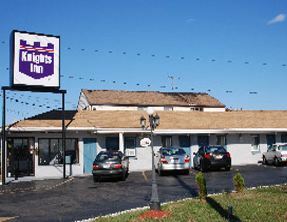 This Knights Inn is located approximately four miles from the Niagara Falls, and is 24 miles from Buffalo-Niagara International Airport. Local nearby attractions include the Aquarium of Niagara, which is only a short drive for this Niagara Falls Motel. Hotel amenities include the Continental Breakfast, seasonal outdoor pool, free parking, copy services, ice machine, and vending machines. Guest rooms feature free wireless Internet access, cable TVs, hairdryers, telephones, free local calls, and irons and ironing boards. Guests can enjoy affordable New York motel accommodations in an ideal location from the Knights Inn Niagara Falls New York Motel only minutes from the World-famous Niagara Falls. This charming motel offers some the best amenities like a free continental breakfast, free wireless high-speed Internet access in all rooms, free coffee, free daily newspapers and free seasonal shuttle service to area attractions. All guest rooms have hairdryer, AM/FM Alarm Clock, Cable Television, Basic Amenities, Refrigerators and wireless high-speed Internet Access. Non-Smoking and handicap accessible rooms are available upon request.